Rounding another curve on the Bernina Express, sometimes we glimpse something – an ancient stone hut, a cliff naturally carved with a quizzical face, a shimmering snow-covered village – then wonder later if it was really there. Sitting comfortably in our train car with panoramic windows is a little like being on a slow-motion toboggan, but warm and cozy, plus we can get a hot cup of coffee from the nice man passing in the aisle with his cart. 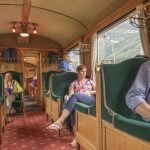 This is the Rhaetian Railway, part of which, has UNESCO World Heritage status – only the third rail line in the world to be so honoured, thanks in part to its “outstanding technical, architectural and environmental ensemble”, says UNESCO. We’re in the Alps of the Swiss canton of Graubünden. In 500 BCE, this area was populated by tribes called the Rhaeti. By 15 BCE, the Roman province of Raetia had been established. 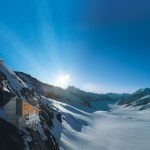 Today, among Switzerland’s 26 cantons, mountainous Graubünden is singular in at least three ways: it’s the farthest east, the largest geographically, and the only one where three Swiss languages – German, Italian and Romansh – are commonly spoken. And Graubünden is home to the Rhaetian Railway’s Bernina Express and Glacier Express, with many narrow tunnels (the Albula Tunnel, nearly 6 km long, is among the highest in the Alps), old bridges, milky streams, villages nestled in valleys – and around every curve another dreamy vista. In winter, the mostly red train cars thread through a striking, mostly vertical tableau (lowest to highest stops: 2252 meters), rising from green fields soon with patches of snow, to deep snow on the narrow valley floors, dark mountain walls and peaks. The conifer branches by the track seem to be decorated with falling diamonds in the afternoon sun. Lots of passengers ride the Rhaetian just to ride the train, agog, through this alpine landscape. Some stop for a night or more in one of the alpine villages or resort towns that welcome tourists at any season, and especially in winter. Yet, we also see locals who take the train every day to work, and who just read their book or check their phone as another moving picture of steep, snowy mountains passes by, putting IMAX to shame. In 1889 when the first part of the railway opened, it was the locals living in these isolated villages who had so much to gain (and lose) – connection to the outside world, which brought in tourists and allowed the villages to reinvent themselves. 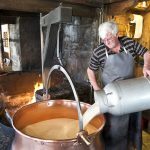 Like Bergün, with its traditionally decorated old buildings, boutique hotels, outdoor fondue, restaurants serving regional specialties, (try the deer sausage at Hotel Ladina) and the world-class Albula Railway Museum (most exhibits in German). Bergün is also a mecca for winter sledding. Here you can rent a sled, then take the train up to the nearby Preda train station, jump on your sled and take a winding 6-km ride on groomed runs (lit at night) back down to Bergün – then stop at an outdoor bar for hot mulled wine. You can even buy your own sled – about CHF 90 for a beginner’s model, all the way up to CHF 900 for a sleek speedster. 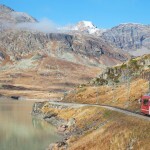 The Rhaetian line also stops at the famous winter resorts of St. Moritz and Davos, and extends into Tirano Italy, and even farther south to Lugano in the Swiss canton of Ticino. You can cherry-pick your overnight stays. And you can ride the Rhaetian by night. One extraordinary excursion takes you “by the light of the full Moon” up to a fondue dinner at Ristorante Albergo Alp Grüm (2091 meters). On the ride up we see huge snow-grooming tractors moving behind their headlights like giant insects on the ski slope. The train pulls right up to the restaurant. On the platform we’re greeted with steaming glühwein (hot mulled wine) and appetizers. Inside everyone is seated at long tables, and we soon meet new friends from Italy and Germany, one of our group serving as our de-facto translator between four languages. After dinner, on the train going back down to the various stops from which we all embarked, the staff turned out all the lights. Outside we could see only fog, no night sky. But it was a “full moon ride”, so the staff surprised everyone with a candle-lit moon paper lantern gliding along the aisle. And just before we arrive at our stop in Pontresina, the real moon rose above the mountain, painting everything blue.